Atlanta’s rout of St. Louis on Saturday night rang in the season’s halfway mark in fitting fashion: The surprise contender with the second-best run differential in the National League keeps pushing forward. The month of June was disappointing by Freddie Freeman’s lofty standards, even drawing rarely heard “slump” labels over its final weeks. From June 16 through Saturday's action, he slashed .180/.268/.240 with only two extra-base hits despite 10 of the 12 games coming against sub-.500 opponents. And yet Freeman still finished the month hitting 38 percent above league average and he still leads all NL position players in wins above replacement. How many hitters wouldn’t trade their career-best months for that top-of-the-charts production? Freeman should still be considered the frontrunner for National League MVP — at least among non-pitchers with Max Scherzer and Jacob deGrom leading the league in WAR — and arguably Atlanta’s best chance at taking home the honor since Chipper Jones’ 1999 MVP campaign. Andruw Jones is the only Braves player to garner double-digit first-place MVP votes since 2000, losing to former Cardinal and future Hall of Famer Albert Pujols in 2005. 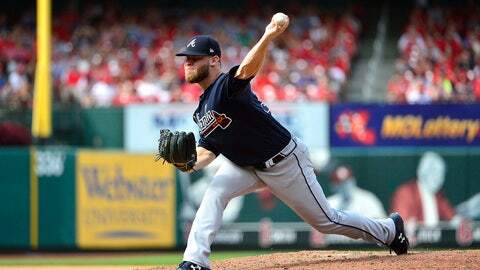 Accounting for lower league averages and better pitching, Freeman’s start is more impressive. He’s hitting 54 percent above league average thanks to a more pitching-friendly environment; despite almost identical on-base and slugging percentages, Jones’ numbers were just 39 percent above the 1999 league average through 81 games. The challenge for Freeman: Can he turn on the afterburners over the season’s second half? 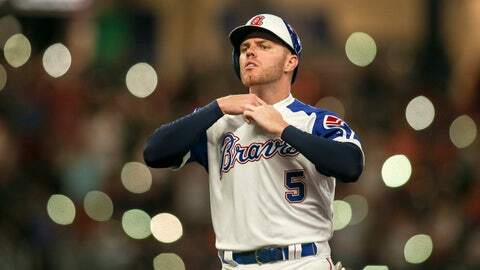 The halfway point served as a de facto launching pad for Chipper, who went off on the greatest extended offensive stretch of his career. Jones homered in game No. 82 of the 1999 season. He then homered in game Nos. 84, 85, 86 and 87. By the time he tagged the Mets for four home runs in a three-game series at Turner Field in late September, he’d tallied 29 home runs over the final 81 games, slashing an absurd .345/.477/.738 over 344 plate appearances and tacking on 16 stolen bases for good measure. He took home 29 of the 32 first-place MVP votes over Jeff Bagwell and Matt Williams. Freeman continued the mirror effect by answering with a two-run homer of his own to kick off the unofficial second half on Sunday. The game is afoot. Despite his recent downturn, Freeman’s overall production does not even reflect his expected performance. According to Statcast, the only player with more plate appearances and a higher expected weighted on-base average — factoring in quality of contact, strikeouts and walks — is Trout. The only players with 325 or more plate appearances ahead of him: J.D. Martinez and Joey Votto. He keeps this elite company year after year, so there’s nothing fluky about his Chipperesque start to the season. Time will tell if his trophy case will eventually display a Chipperesque end to it. Mike Moustakas. Josh Donaldson. Todd Frazier. Adrian Beltre. Jed Lowrie. Austin Riley. 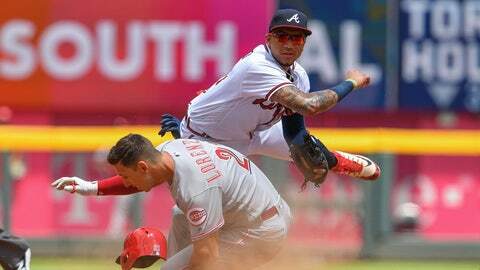 The list of third-base possibilities piled up in preseason and throughout the first few months of Atlanta’s season for its oft-noted need at the hot corner. Trade candidates, free-agent options and prospect call-ups have defined the Braves’ future at third base — all in spite of Johan Camargo, who profiled as a super-utility player, posting 2.6 wins above replacement per 162 games since being called up last season. And he’s only getting better, particularly in terms of plate discipline and production against right-handed pitching. All of which poses the question: Will Camargo’s production, combined with Charlie Culberson’s help off the bench and Riley’s promise, allow the Braves to shift trade-deadline focus to pitching? At what point does a player like Camargo get defined less by profile and more by MLB production, which currently states he’s an above-average hitter with a plus glove and arm under club control for a long time? The 24-year-old is now slashing .254/.357/.434 with 19 extra-base hits this season. 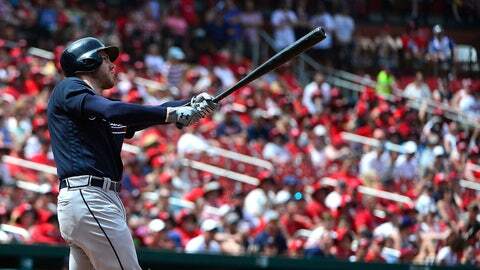 Only All-Star probables Freddie Freeman and Nick Markakis have a higher on-base percentage on the roster. At a league- and park-adjusted rate (wRC+), he’s hit better than Moustakas, Kyle Seager, Rafael Devers and Evan Longoria among third basemen with at least 200 plate appearances in 2018. The Braves have not had to bury the former minor-league slap hitter in their lineup; in fact, Camargo has earned consideration for hitting at the top of the lineup, though manager Brian Snitker continues to force-feed leadoff at-bats to Ender Inciarte. If Camargo can continue to hit like an MLB regular throughout July, it will be intriguing to see what moves Alex Anthopoulos and the front office decide to make before the non-waiver deadline and if any of those moves aim to address a position that no longer appears to feature the forgettable carousel that followed Chipper Jones’ retirement. The criticism for Atlanta’s bullpen continued its crescendo on Sunday as the relief corps nearly coughed up a 6-0 lead before Dan Winkler and A.J. Minter slammed the door for a one-run win. There’s one significant outlier in those numbers above: The league- and park-adjusted ERA in June. In terms of controllable performance (fielding-independent pitching), Atlanta’s relievers have stayed within 3-5 percentage points of league average this season. They started allowing runs in bunches last month, though. Their strand rate — how many runners they left on base — dropped to 63.2 percent, the second-lowest mark in the majors last month. That is both a sign of misfortune as well as opponent’s quality contact catching up to Atlanta: Braves relievers are allowing line drives on 26 percent of batted balls this season, the worst mark in baseball. At this point, it would be shocking if the Braves do not shake up Snitker’s relief options before Aug. 1 hits. Winkler and Minter are the only two consistent shutdown options available at the moment. The farm system boasts multiple options on call (Evan Phillips, Wes Parsons) with more on the way in the form of top prospects. It’s shaping up to be a buyer’s market for relievers with non-contenders boasting stockpiles of productive relief options. Poor June luck notwithstanding, It appears to be a matter of time before the front office elects to make a move.